Mega-sporting events (MSEs) are the pinnacle of global sport, but cannot stand apart from their very significant social impacts – both positive and negative. Sporting events can enhance freedoms and celebrate human dignity, but can also amplify discrimination and abuse. It is critical to ensure that the world of sport is in full alignment with the UN Guiding Principles on Business and Human Rights and other international human rights and related instruments, principles, and standards. 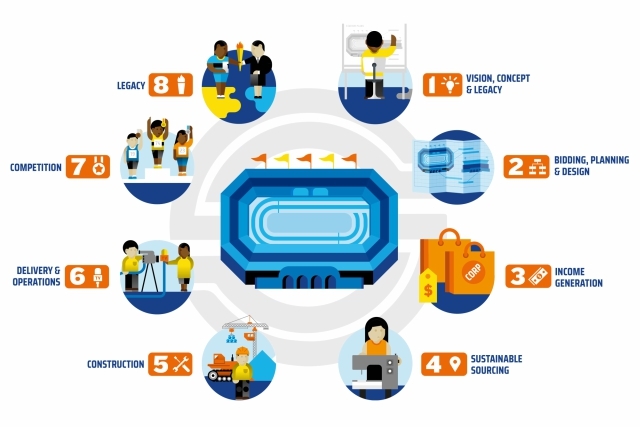 "The Mega-Sporting Event Lifecycle: Embedding Human Rights from Vision to Legacy" presents the lifecycle of a mega-sporting event, with specific elements of good human rights practice at each stage that those involved in hosting the event should integrate into their planning, delivery, and legacy in order to ensure a rights-compliant event. This Guide has been developed by MSE Platform Task Force on Host Actors chaired by Sandra Lendenmann Winterberg (Head, Office of Human Rights Policy, Swiss Federal Department of Foreign Affairs) and Ambet Yuson (General Secretary, Building and Woodworkers International), with input from the members of the Task Force and drafting led by William Rook and Alison Biscoe (IHRB), with support of Lucy Amis (IHRB Research Fellow). The Guide is also available in French, and Japanese.